CBS ArcSafe introduces the RRS-3 EntelliGuard G for General Electric Type G air circuit breakers which is a cost-effective solution for keeping operators safe when compared to other arc-flash mitigation alternatives. CBS ArcSafe®, a leading manufacturer of remote racking and switching solutions for low- and medium-voltage switchgear, introduces its single-application remote racking system (RRS) for General Electric Type EntelliGuard G air circuit breakers. 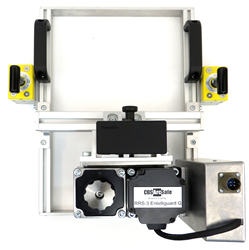 The lightweight, portable CBS ArcSafe RRS-3 EntelliGuard G allows technicians to remotely install and remove the circuit breaker from a safe distance of up to 300 feet while remaining stationed outside the arc-flash boundary. The RRS-3 EntelliGuard G is a cost-effective solution for keeping operators safe when compared to other arc-flash mitigation alternatives. Installation and operation do not require any modifications to the existing electrical equipment, thanks to CBS ArcSafe’s magnetic latching system. The RRS-3 EntrelliGuard G is compatible with Type EntelliGuard G air circuit breakers with ratings of 400–6000 A, including GG/GJ/GH/GK-04/07/08/10/13/16/20/25/32/40/50/64. Typical applications for the EntelliGuard G breaker include protecting and switching the main line, as well as feeders and incoming lines at 280 VAC, 480 VAC, and 600 VAC requiring fault interruption up to 150 kA. Optional features include 25-foot extension cables, 24 V DC LED light, wireless video camera system with LCD monitor, and rugged protective case assembly. All RRS-3 units are portable, fast, and easy to set up; offer mechanical and/or electrical safety protection; adjust to fit unique electrical equipment configurations; reduce the requirements for personal protection equipment; and help customers with NFPA 70E arc-flash safety compliance. All CBS ArcSafe products are manufactured in the United States at our facility in Denton, Texas. For more information, visit CBSArcSafe.com or call 877-4-SAFETY. CBS ArcSafe offers the electrical industry’s largest inventory of remote racking and switching solutions for low- and medium-voltage switchgear that do not require modification to existing equipment for operation and allow technicians to operate equipment from a safe distance of up to 300 feet. All our equipment is manufactured in the United States at our Denton, Texas, facility. CBS ArcSafe offers 24/7/365 emergency support and is happy to develop custom remote racking and switching solutions for customers. Learn more at CBSArcSafe.com or call toll-free at 877-4-SAFETY.